The economic threshold is the point where the economic value of the yield lost due to feeding equals the cost of control. 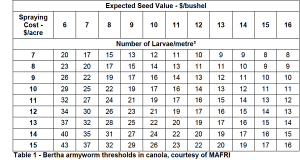 Thresholds for bertha armyworm are based on larvae counts, and counts can be highly variable even within small areas. It often happens that one field is at thresholds while others immediately beside are well below. If you see neighbours spraying, scout to see if your fields have berthas at all or anywhere near thresholds. The economic threshold for bertha armyworm will vary with the cost of the insecticide, the method of application and the crop’s value. 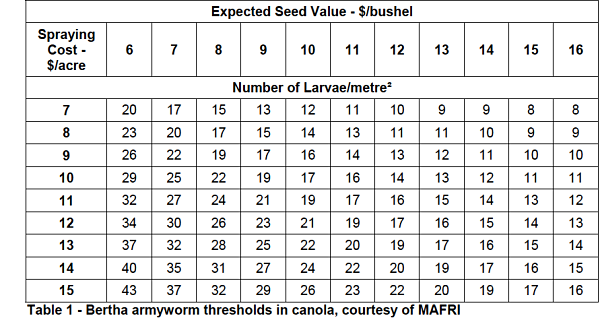 Using crop values and application costs, the following table indicates the larval density (larvae/m2) at which an insecticide treatment in canola would be warranted. For example, spraying would not be economical if larval counts were less than 16 per m2 given a crop price of $485.10/t ($11.00/bu) and a spray cost of $24.70/ha ($10.00/ac). Under drought conditions, where bertha armyworm feeding is concentrated on canola pods by early leaf drop, economic thresholds may be lower.